"Once the painting is done, it starts an independent life, having a relationship with the space, which has nothing to do with me or the viewer," Swiss artist Felice Varini said in an interview with Poetic Mind about his body of work, something that never ceases to amaze. Based in Paris, Varini is known for his mind-bending designs that create three-dimensional illusions when looked at from a certain angle. His paintings challenge reality through visual tricks that rely on the architecture of a space. His large-scale optical illusions are made from flat graphics painted onto surfaces like staircases, rooms, highways, or hallways. When viewed from a certain perspective, they seem to float in the air, hovering like objects in space. 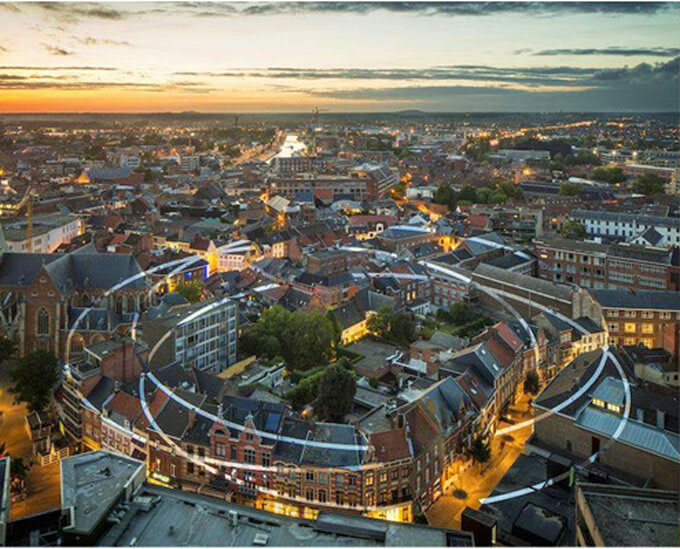 Varini&apos;s latest piece, Trois ellipses ouvertes en desorder, touches 99 buildings to create a remarkable mural that can only be seen from above. From any other viewpoint, all you see are fragments of shapes and lines. That&apos;s the beauty of these ephemeral creations; they only appear for a moment, and in that moment, they have the power to blow you away.